"What is happening today is the history of tomorrow; You cannot change it but you can design it"
Poramate Manoonpong was born in Nan, Thailand, in 1978. Currently he is a 1000-Plan Professor at Institute of Bio-inspired Structure and Surface Engineering, Nanjing University of Aeronautics and Astronautics, China. He has been an invited Professor of School of Information Science & Technology at Vidyasirimedhi Institute of Science & Technology (VISTEC), Thailand, and has served as an Associate Professor of Embodied AI & Robotics at the University of Southern Denmark (SDU), Denmark. He received his B.Eng. degree in mechanical engineering from the King Mongkut's University of Technology Thonburi, Thailand, in 2000, M.Sc. degree in mechatronics from Fachhochschule Ravensburg-Weingarten, Germany, in 2002, and Ph.D. degree in electrical engineering and computer science from the University of Siegen, Germany, in 2006. He was a JSPS Postdoctoral fellow at Advanced Telecommunications Research Institute International, Computational Neuroscience Laboratories, Department of Brain Robot Interface, Kyoto, Japan. He was also the group leader of the Emmy Noether research project for "Neural Control, Memory, and Learning for Complex Behaviors in Multi Sensori-Motor Robotic Systems" at Bernstein Center for Computational Neuroscience (BCCN), Department for Computational Neuroscience, Third Institute of Physics-Biophysics, the University of Goettingen, Germany. He has been PI or co-PI of 12 funded projects. Currently he serves on an Associate Editor of Frontiers in Neuroscience (Neurorobotics) and Adaptive Behavior (SAGE journal), the editorial board of International Journal of Advanced Robotic Systems (ARS), (Topic: Bioinspired Robotics) and Advances in Robotics Research, Techno press, and as a program committee member for international conferences and workshops. He has published over eighty publications in major robotics journals and conferences and and edited two books. Research interests: Embodied AI, machine learning for robotics, neural locomotion control of walking machines, biomechanics, dynamics of recurrent neural networks, learning/plasticity, embodied cognitive systems, prosthetic and orthopaedic devices, exoskeletons, brain-machine interface, human-machine interaction, service/inspection robots. My long-term agenda: "To understand how brain-like mechanisms including biomechanics can be realized in artificial agents so they can become more like living creatures in their level of performance"
In order to achieve my goal, I have developed neural mechanisms for locomotion generation and adaptation in legged robots, e.g., dynamic biped walking robot "RunBot" and adaptive animal-like robots �AMOS�. 2017, The Thousand Talents Plan of China under the category "the Recruitment Program for Young Professionals"
2012-2013, Artificial Intelligence & Robotics, Master & Bachelor level course (B.Phy.5638, 3 ETCS), University of G�ttingen, Germany, Winter semesters: WS12 & WS13. Since 2014, Adaptive embodied locomotion control systems (with J�rgen Christian Larsen), Master level course (RMAI3-U1, 5ETCS), University of Southern Denmark, Denmark, Every autumn semester. Since 2014, Tools of Artificial intelligence, Master level course (RMAI2-U1, 5 ETCS), University of Southern Denmark, Denmark, Every spring semester. Since 2015, Project in Artificial Intelligence (with John Hallam), Master level course (RMAI4-U1, 10 ETCS), University of Southern Denmark, Denmark, Every autumn semester. 2015, Embodied Artificial Intelligence, Master level course (Etit-999, 3 ETCS), University of Kiel, Germany, Winter semester: WS15. 2016, �Biomechanics & Locomotion Control from Insects to Robots�, Summer course, Master level, Nanjing University of Aeronautics and Astronautics, Nanjing, China, 8, 11-13.07.2016. 2017, �Embodied Artificial Intelligence�, Summer course, Bachelor level, Biomedical Engineering, Rangsit University, Thailand, 03.07.2017-02.08.2017. 2017, �AI & Robotics�, IST596, Master/PhD levels, School of Information Science & Technology Vidyasirimedhi Institute of Science & Technology (VISTEC), Thailand, 14.09.2017-15.09.2017. Since 2018, “Embodied Artificial Intelligence”, IST532, Master/PhD levels, School of Information Science & Technology Vidyasirimedhi Institute of Science & Technology (VISTEC), Thailand, Every spring semester. Supervision of undergraduate, master, and PhD research projects, over 80 students, see pdf file. 2014, �Using Biological Inspiration to Develop Autonomous Walking Robots�, Scientific method course (SM-SCM), Master level, University of Southern Denmark, Denmark, 5 ECTS, 09.04.2014. 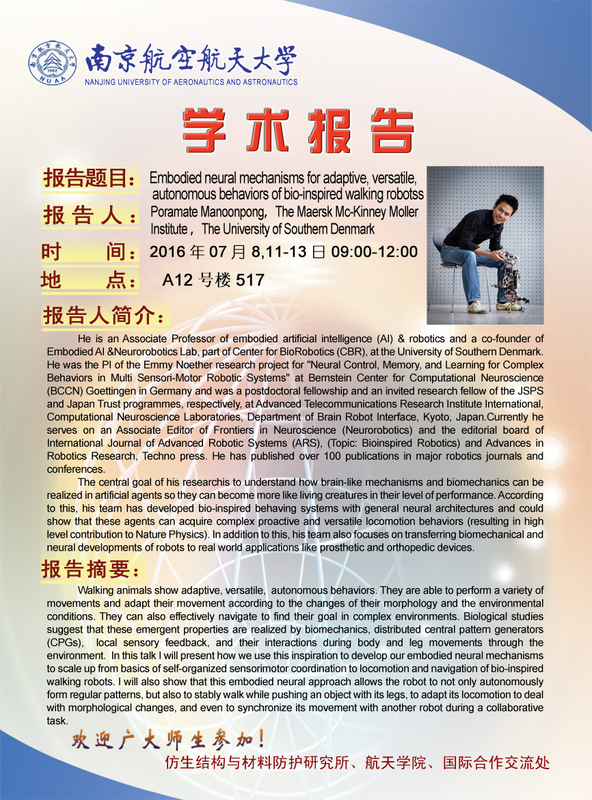 2015-2016, �Reinforcement Learning�, Statistical machine learning course (RM-SML-U1), Master level, University of Southern Denmark, Denmark, 5 ECTS, 22.04.2015. 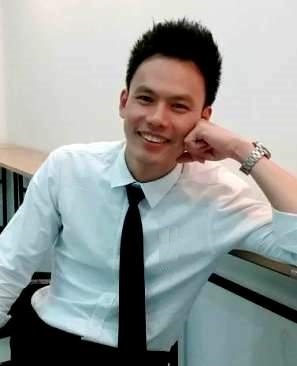 2015, �How to do research�, Research methodology course (EEM601), PhD level, King Mongkut's University of Technology Thonburi (KMUTT), Thailand, 6,11,13.08.2015. 2015, �Thinking in Science�, Scientific methods course (SM-SCM), MSc level, University of Southern Denmark, Denmark, 5 ECTS, 29.09.2015. 2015, �Locomotion in invertebrates and robots�, Biomechanics and Biomimetics/Bionik course (biol201), Master level, University of Kiel, Germany, 25-26.11.2015. 2016, �Locomotion control and robotics�, Grundlagen der Bionik/ Basics of Bonics course (Modul biol167), Bachelor level, University of Kiel, Germany, 10.03.2016. 2016, �Artificial neural networks: An Approach to Build Brains for Bodies�, Robotic course, Master level, Department of Electrical Engineering, Kasetsart University, Thailand, 24.11.2016. 2017, �Locomotion control and robotics�, Grundlagen der Bionik/ Basics of Bonics course (Modul biol167), Bachelor level, University of Kiel, Germany, 28.02.2017. 2017, �Artificial neural networks: An Approach to Build Brains for Bodies�, Robotic course, Master level, Department of Electrical Engineering, Kasetsart University, Thailand, 18.12.2017. 2018, “Biomechanics and Bio-inspired Locomotion Control from Animals to Robots”, Bionic Science and Technology course, Master/PhD level, Nanjing University of Aeronautics and Astronautics (NUAA),11,15,18 10.2018. 2015, Workshop on Robot technology and supply chain for the factory of the future, organized together with Trisak Group under the RETURN project, Swissotel Nai Lert Park Bangkok, Thailand, 15.12.2015. 2015, Workshop on Embodied sensorimotor interaction: from locomotion to collective behavior at SWARM 2015: The First International Symposium on Swarm Behavior and Bio-Inspired Robotics, Kyoto, Japan, 28.10.2015. 2016, Tutorial on Exploiting Soft Materials, Biomechanical Structures, and Neural Mechanisms for Adaptive Locomotion at The 14th International Conference on the Simulation of Adaptive Behavior (SAB2016), Aberystwyth, UK, 23.08.2016. 2016, Danish-Embodied Artificial Intelligence Workshop, Odense, Denmark, 10.11.2016. 2017, Workshop on Bio-inspired Robotics, Century Park Hotel, Bangkok, Thailand, 24.06.2017 (program in Thai) (supported by OHEC Thailand) (registration link). 2017, Workshop on Bio-inspired control for interlimb coordination and adaptation in legged robots at SWARM 2017: The Second International Symposium on Swarm Behavior and Bio-Inspired Robotics, Kyoto, Japan, 29.10.2017. 2018, The 15th International Conference on the Simulation of Adaptive Behavior (SAB2018): Frankfurt, Germany, 14-17.08. 2018. 2018, The 2nd International Youth Conference of BionicEngineering (IYCBE2018), Odense, Denmark, 7-9.11.2018. 2018, Workshop on Advanced Human-Machine Interaction for Improving Quality of Life and Health at the 22nd International Computer Science and Engineering Conference (ICSEC 2018), November 21 (full-day) 2018.